Many of you reading this have no idea who Ken Miles is, or his life of racing. Indeed, in the history of racing, Ken Miles and his life may be but few pages, compared to the chapters upon chapters of men such as Enzo Ferrari or Carroll Shelby. However, his story marks an incredible turning point in the story of these men, Ford Motor Company, at the time undisputedly the most prestigious race in the entire world (Le Mans), and millions of others. Ken Miles life of racing is a tale of triumph and tragedy. He developed the car that broke the greatest dynasty in the greatest race in the world, and yet not only was he robbed of his greatest achievement, but perished attempting to do it all again. And all of this was when he was 47 years young. Miles grew up in England, and was a tank driver in World War II. He never said very much about the war, but could often be seen at racetracks wearing an old jacket, much like a knight would wear his suit of armour after victory in a joust. After the war, Miles fell in love with racing and moved to Hollywood, where he became a fixture on the sports car scene for the next two decades. Often in cars that he himself had made, he dominated and even ran a tuning shop for a time. However, because he was a racer in the 50’s, he had one small problem: no money. Eventually in early 1963 the shop was foreclosed, and Miles had no choice but to join up with a Le Mans winning, fast talking, tough Texan by the name of Carroll Shelby. “How would you like to work in a snake pit for a real snake?”- Carroll Shelby conducting a job interview for a new secretary. In 1962, after Ford Motor Company decided to get back in the racing business generally in order to stop Ferrari’s dynasty in Le Mans (More on that later), Shelby, who retired in 1960 from active competition due to a bad heart, showed up on Ford’s doorstep with a unique proposition. Ford approved, and Shelby decided to get a crew of “hot rodders” together to build what would become the first Cobra- Miles would become the competition director, driver, and test driver for Shelby America. The program quickly became a remarkable success- by the summer of 1963 the Cobra was the hot item for all the celebrity’s, and even had a top 40 radio hit named after it (“Hey Little Cobra”). In 1964, Ford brought a decidedly English car (The GT40, heavy but powerful) to Le Mans with one goal: to stop Ferrari’s dynasty at Le Mans (Including 1964, Ferrari had won at Le Mans 6 times out of the 7 previous years, 1959 being won by Carroll Shelby in an Aston Martin), and, well…… they lost. Badly. None of the cars made it through the night. Ford made the choice to hand the GT40 project from “Mr. Aston Martin” John Wyer to Shelby America, after the Cobra won the GT class in Le Mans that year. 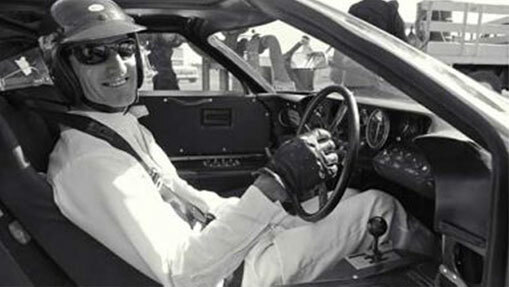 Ken Miles was named the official test driver for the prototype. Miles was never supposed to race the car in competition; Ford had built a Hall of Fame driving roster featuring such names as AJ Foyt, Bruce McLaren, Phil Hill, Dan Gurney, a young Itallian-American by the name of Mario Andretti. But Miles couldn’t stand watching somebody else drive the car he had helped to develop, and so he found himself in a Shelby GT40 come the 1965 Daytona Continental 2,000 KM race. 12 hours later, Miles and co-driver Lloyd Ruby found themselves in victory lane, as the Shelby bunch finished in the top 5 positions overall. It was the first win in 40 years for an American manufacturer in international competition, and there was no better time or place for either Miles or Ruby. Le Mans, however, proved a different task. In the 1965 Le Mans 24 hour, it was Ford’s race to lose. Phil Hill broke the track record in qualifications in a Shelby GT40, and during the first pit stops the drivers were laughing at how much faster the Fords were to the Ferraris. However, by the 7 hour mark, doom had hit Ford- a defective gearbox ruined Miles and his co-pilot Bruce McLaren, while Hill’s clutch went out after setting a new race lap record. Ford once again decided to change directions following the race, this time dividing the Le Mans project into two separate teams- Shelby America and the face of Ford in NASCAR, Holman-Moody. Miles still served as the test driver for all cars, however, and was still in a Shelby GT40 come Daytona in Feburary. “Holman Moody this, Holman Moody that. You know, someday you’re going to get beat, and it better be by Ferrari”- Carroll Shelby to Carroll Smith. Much has been said about “Big” Bill France, but one thing is for certain: he loved to prove, even in his own mind, that everything he did either was the best or was equal to the best. In 1966 France extended the Daytona Continental into a 24 hour race, the only 24 hour race in the entire world with the exception of Le Mans. Shelby knew this, the 12 hours of Sebring, and Le Mans would decide the fate of Ford’s foray into international racing, that if both were a failure there wouldn’t be a 1967 Ford GT40. He made sure Miles was on his team. Everybody was wondering; Could even the Ferraris hold up for 24 hours at Daytona? Most thought the Fords wouldn’t survive, and if they did Holman-Moody would finish the strongest because of their experience on the high banks of Daytona. Miles and Ruby proved the doubters wrong and won the fastest endurance race in Daytona up to that point (Really impressive considering the race was extended by 12 some hours), beating out both Ferrari and Holman-Moody. The next stop was Sebring, and of course Miles won that too, impressively winning in a duel with Dan Gurney that ended with Gurney pushing his car to the finish line after suffering a blown engine in the last few hundred yards. Around this time, Ken Miles, at the unlikely age of 47 and after two decades of racing, became a superstar. Miles never attempted the Indy 500, never raced in Formula 1, and yet he was beating the very best in the entire world on some of the biggest stages in the world. Ken Miles should of won the 1966 24 hours of Le Mans, or at the very least be named the co-winner. But alas, that wasn’t the case. With a few hours left in the race, Ford came to Carroll Shelby with an idea- Miles was a couple of laps ahead of Bruce McLaren, and Ford wanted to attempt to stage a tie. Miles, though, wasn’t happy. Eventually, Miles slowed down and allowed McLaren to come back. Both came out of the final turn and crossed the line together. However, Le Mans officials cited an ancient rule that took into account a car’s starting position. Because McLaren started behind Miles, he was ruled to have traveled some 20 more yards than Miles over 24 hours, and was rewarded the victory. A couple of months later, Miles was testing a new Ford prototype at Riverside Speedway. Trying to do it all again and come away with a Le Mans trophy this time, Miles spent all day developing this new car until the final run of the day. “Please be careful in how you report what I have said. I work for these people. They have been awfully good to me”- Ken Miles after giving an interview in the month following Le Mans. Ken Miles was denied being the first and only Triple Crown Endurance Champion in the entire world, and was never given another chance at it. Shelby was heartbroken, even 40 years later. Maybe the most shocking and bizarre attribute Miles had on the racing community after his death happened in June of the next year. Mario Andretti had a horrible wreck in a version of the prototype Miles tested at Le Mans, but because of a steel bar Ford implemented after Miles’ fatal wreck, Mario lived. The story of Ken Miles is one of the great What If stories in racing, and yet nobody ever speaks about it. At least now you know the story.